The Los Angeles Crisis Response team said Sunday that "we lost a great musician" and support has been offered to Hussle's family. 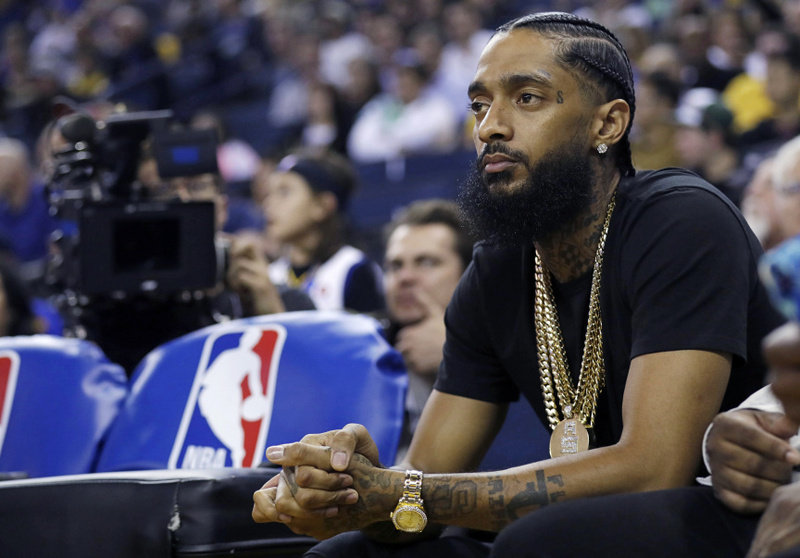 "Our prayers are with them and all those who knew and loved Nipsey Hussle," the crisis team said. Representatives for the rapper didn't immediately respond to emails seeking confirmation of his death. The Eritrean-American said his first passion was music but getting resources was tough since he left his mother's house at 14 to live with his grandmother. Hussle said he got involved in street life as he tried to support himself, and he joined the gang Rollin 60's Neighborhood Crips as a teenager. "The culture of my area is the gang culture ... so by being outside, being involved with hustling, being in the hood, doing things to try to get money, being young, you know riding your bike through the hood, getting shot at, your loved ones and homies that's your age getting killed, getting shot at ... it's like, we were just raised like if you with me and something goes now, I'm in it, whether I'm from the (expletive) or not," he said in a 2014 interview with VladTV. "So after a while it just be like you always in the middle of some (expletive), you might as well, you know what I mean ... be part of it. Or don't be a part of it and get the (expletive) out the way." Music eventually happened for Hussle. The proud West Coast rapper released a number of successful mixtapes that he sold out of the trunk of his car, helping him create a buzz and gain respect from rap purists and his peers. In 2010 he placed on hip-hop magazine XXL's "Freshman Class of 2010" — a coveted list for up-and-coming hip-hop acts — alongside J. Cole Big Sean, Wiz Khalifa, Jay Rock and others. Hussle continued to build more hype for himself, and Jay-Z even bought 100 copies of Hussle's 2013 mixtape "Crenshaw" for $100 each, sending the budding rapper a $10,000 check. But Hussle, who was once signed to Sony's Epic Records, hit a new peak with "Victory Lap," his critically acclaimed major-label debut album on Atlantic Records that made several best-of lists last year, from Billboard magazine to Complex. The album debuted at No. 4 on Billboard's 200 albums charts and featured collaborations with Kendrick Lamar, Diddy, CeeLo Green and more. "It's my debut album so for my first one (to be nominated) out the gate, it's like, it was overwhelming a little bit. It was ... inspiring, humbling," he said in an interview with the Recording Academy on the 2019 Grammys red carpet. The world mourned his death on social media Sunday. NBA star Steph Curry tweeted, "God please cover and restore @NipseyHussle right now!!!" "This doesn't make any sense! My spirit is shaken by this!," Rihanna wrote on social media while posting photos of Hussle with his daughter and another with his fiance. "Dear God may His spirit Rest In Peace and May You grant divine comfort to all his loved ones! I'm so sorry this happened to you @nipseyhussle." "So much hatred. We live like our brothers and sisters in third world countries live. Right in America," he continued. "Its so deep rooted. It's not a easy fix. Hard to fix anything when kids are still living in poverty. I ain't shutting up though, Nipsey is a True voice. He will never be silenced." Hussle was also a strong businessman. In a story published in February, Forbes wrote that the rapper and business partner Dave Gross purchased the Crenshaw plaza where his Marathon Clothing store is located, and had plans to knock it down and "rebuild it as a six-story residential building atop a commercial plaza where a revamped Marathon store will be the anchor tenant." In 2016, Hussle and rapper YG released the protest song "FDT," short for "(Expletive) Donald Trump," criticizing the U.S. President's policies when he was the Republican presidential candidate.